Keeping Your Clothing in Circulation – Rewear. Reuse. Recycle. It takes a great deal of effort and resources to produce the clothing hanging in your closet. For example, it takes over 700 gallons of water to make a t-shirt; that’s how much water a person would drink in a four years. The textile industry is also a major pollution source, which is why organizations like the National Resource Defense Council have begun partnering with clothing designers to combat the toxicity of fashion. There is one very simple way that the average person can take to offset the negative impacts of clothing production. 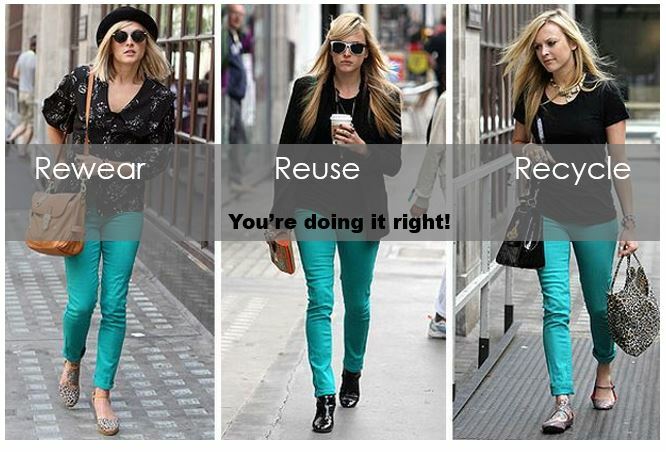 Respect your clothing by reusing it for as long as possible. Weather by keeping clothing in good condition in your own closet or properly recycling items that you no longer wear. Extending clothing by just three months of active use would lead to a 5 – 10% reduction in each of the carbon, water and waste footprints. Respecting the products we purchase moves us from consumers to owners. “Owners are empowered to take responsibility for their purchases – from proper cleaning to repairing, reusing and sharing. Consumers take, make, dispose and repeat – a pattern that is driving us towards ecological bankruptcy,” Rose Marcario, President and CEO of Patagonia. We owe it to ourselves and the planet to make our clothing last as long as possible. Rewear. Reuse. Recycle. Here are some owner laundry hacks from Love Your Clothes for keeping your clothing in circulation for a long as possible. Out, damned spot! Blood: pre-soak 1 hr. in heavily salted cold water or detergent. Candle wax: Cover the stain with brown paper and use a warm iron over the top to draw out the melted wax. Gum: Put clothing in the freezer as once the gum is hard and brittle it can easily be scraped off with a butter knife. Removing the smell of cigarette smoke: Not quite a stain, but baking soda and white vinegar will work. Mix up 8.5 oz. of each and soak the clothing for 1 hr. Wring out and then wash as usual. Cooking fat: Create a paste of baking soda and a little water and apply to stain, let sit for 30 min., then wash in biological detergent. Crayon: if the crayon is soft, freeze the fabric to harden the crayon, and then scrape off the excess. Place the stain between clean paper towels and press with a warm iron to transfer the stain to the paper towels. Repeat as needed. Pre-treat with a pre-wash stain remover, blot and let dry. Grass: blot with denatured alcohol and allow to dry, then wash as normal. Ink stains: spray with hairspray and blot with a paper towel. Mud: pre-soak clothes as soon as possible in a bucket of cold water with three tablespoons of baking soda for at least an hour. Then wash with a biological detergent and line dry. Red wine: Make a baking soda and water paste and layer it onto the stain. Leave for a few hours, then moisten and then wash. You could also try continually rinsing with carbonated water. Sweat Stains: Soak in white vinegar for 1 hour, rinse and then wash.
How to you wash your blue jeans? Inside out, in cold water and on delicate cycle? The denim gods say there are much better ways to “clean” your jeans. It has been reported that fashion designer Tommy Hilfiger “never” washes or dry cleans his jeans for fear they will fall apart. He is not the only one on the no wash train, Levi’s CEO Chip Bergh says you should never machine wash your jeans. “We learned that an average pair of jeans consumes roughly 3,500 liters of water — and that is after only two years of use, washing the jeans once a week,” said Bergh. Levis stand strong that not washing your jeans helps the product to last longer. Spot clean stains and wear your jeans for 6 months before you even think about cleaning them. Here is how Carl Chiara, director of brand concepts and special projects for Levi Strauss & Co. told the Wall Street Journal his method for a semiannual cleaning, “he fills a bathtub to about six inches with room-temperature water and adds two tablespoons of Dr. Bronner’s Magic Liquid Soap, which he likes because it is mild. Then, he immerses the jeans in the tub, laying them flat.” No scrubbing either, just let your jeans chill in the tub for 20 minutes and then hang by the belt loop to air dry. Other traditional washing alternatives include freezing and steaming your blues. You can freeze an odor out of your jeans and kill bacteria with an eight hour icebox nap. Just fold and bag your jeans (giant freezer bag) and they will emerge crisp and fresh. Or you can hang your jeans in the back of the shower so they can steam clean while you clean yourself.